IOWA CITY – It would have been easy for Cole McDonald to give up. The Hawkeye senior right-hander has had a circuitous journey throughout his baseball career. But when Iowa opens the 2019 season on February 15 against George Mason in Kissimmee, Fla., the first Hawkeye to take the mound for head coach Rick Heller’s club will be McDonald. A number of circumstances arose that seemed like they would have made it hard for McDonald to even play baseball in college, let alone start on Friday nights in the Big Ten. He hails from New Hampton, Iowa, a town of 3,500 that sits 40 miles north of Waterloo. 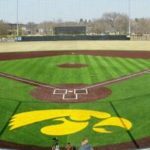 The state of Iowa’s summer baseball schedule already makes it increasingly difficult for players to be scouted and recruited, especially those in small, rural towns. To make matters worse, McDonald blew out his elbow as a high school junior and necessitated Tommy John surgery, wiping out his entire senior season. The best time for him to get college coaches interested was, just like that, gone. But McDonald was not going to give up. “When I was younger, my dad would give me articles, and say, ‘Hey, this could be you,” remembered the senior. Without much college interest, he went with his father to camps at Creighton and Iowa. It was at the camp in Iowa City in which the Hawkeyes got interested and gave McDonald a chance. That opportunity was a spot on the pitching staff, and a chance as a freshman to pitch immediately – McDonald made 8 midweek starts in 2016, his return to the mound from his injury, and posted a 3.33 ERA. Things were looking up. Then, he endured a sophomore slump. Moved into the weekend rotation on Iowa’s NCAA regional team in 2017, McDonald struggled, to the tune of a 6.96 ERA in 11 starts. He struggled mentally, as well, and could have fallen into a hole that many pitchers can’t get themselves back out of. The fact that he didn’t is one of the many reasons that McDonald heads into his senior season as a team captain with a potential professional career to look forward to when the year is done. McDonald’s leadership qualities, work ethic, and mental fortitude helped him bounce back and put together a strong junior season in the weekend rotation in 2018. 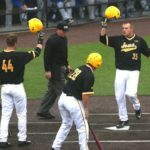 He started off the year in the fall by throwing a no-hitter against the Czech Republic at the World University Games in Taiwan, Iowa’s first nine-inning no-hitter since 1965. In the spring, splitting the season between starting on Saturdays and Sundays, he had a 3.23 ERA in over 55 innings, while striking out 52. After a late-season scare with his elbow that caused him to miss 2 starts, McDonald returned late in the year to his old self, including tossing his fastball up to 94 miles per hour, a mark that has professional scouts noticing. D1Baseball.com ranked McDonald the 13th-best draft prospect in the Big Ten conference this year. Not bad for a kid from New Hampton, Iowa, who didn’t pitch an important portion of his high school career. It’s that attitude that will help McDonald be the vocal leader of a new-look pitching staff for the Hawkeyes. 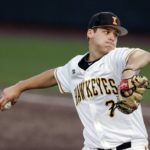 McDonald is the only returner of Iowa’s top 4 leaders in innings pitched from last season, a group that does not include bullpen stalwart Nick Nelsen, who graduated. 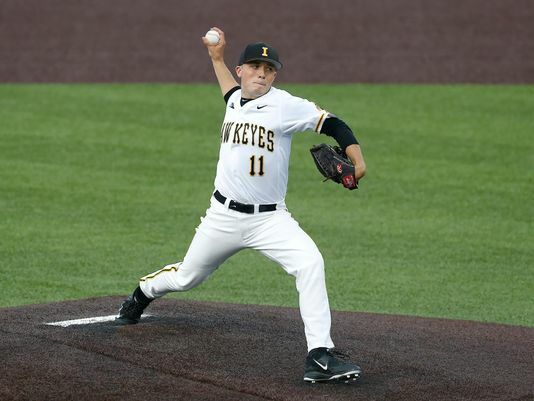 Iowa may have some questions marks towards the end of its rotation, and throughout its brand-new bullpen, but every Friday night, there will be the same workhorse taking the mound, attacking the zone, and giving Iowa a chance to win. “I want to show everyone out there all the work we’ve put in,” said McDonald.